Stamford Talk: Eat, Think, Drive, Blog! : John C. Reilly Really Sang Karaoke at Black Bear Stamford!!! 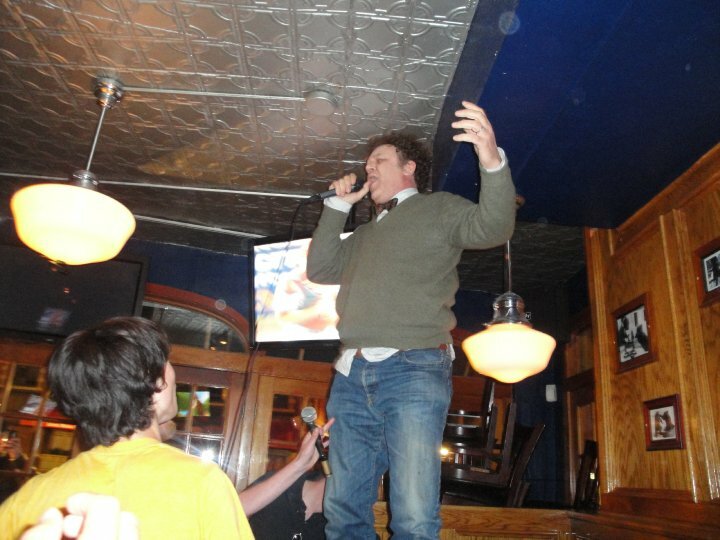 John C. Reilly Really Sang Karaoke at Black Bear Stamford!!! Oh my goooooood if I didn't have a really bad cough, I'd laugh out loud. I am so thankful to the reader who took time out of his day to send me this. I mean, really, what else is there to say. This picture is fantastic! I am SO BUMMED I was not there. I think the karaoke might be even cooler than watching DeNiro. I'd trade my DeNiro scene watching for John C. Reilly karaoke singing watching. I bet he sang "walk hard"
AWESOME!! Is that dark-haired youth in the yellow shirt facing JCR actually Tilda Swinton? Kinda looks like it might be. Unbelievable! Wonder if he sang "Mr. Cellophane..."
and you know what, if you look at her hair in this image from the movie (see link below), it's EXACTLY that style... you may be right!